Sweet Dixie is home to Southern Street Food in the heart of the Long Beach arts district. Stay local, be happy and always, eat well! Sweet Dixie Kitchen is on the corner of 3rd and Elm streets in the Arts District in Long Beach. We are in the kitchen daily, personally plating each plate of food, developing new recipes and producing some of Long Beach’s best biscuits, breakfasts, comfort food and pastries. It’s traditional Southern cuisine but much is redefined to be healthier and lighter. “There is simply no reason food can’t look and taste amazing with the best ingredients, better cooking methods,” says Chef. Come experience food- the way we do in the South, as connection - we spend time together and celebrate each other with a meal. Stay local, stay happy and always eat well!! Please note: All menu items subject to change based on seasonal availability. We are a small family business and space can be an issue at times of high volume. Some online menu items may differ from menu in store, on a day to day basis. *Kitchen closes appr. 30 min earlier. Baked goods and Beverages and happy hour until 15 min prior to close. Check out our Beer, Bubbles and Wine specials available now. House made mesquite chicken hash, sriracha BBQ sauce, scrambled eggs topped with sour cream and house made corn salsa. Fluffy eggs scrambled w/ beef or soy chorizo and cheddar cheese drizzled with chipotle aioli on warm biscuit. Warm biscuit, fluffy scrambled eggs, melted Swiss, . The Original BiscuitWitch. Fluffy scrambled eggs with chopped up bacon, melted cheddar jack cheeses, topped with spicy sausage gravy. saucy buffalo pulled chicken, cole slaw, over easy egg on warm biscuit. Warm buttermilk biscuit, turkey, roasted tomato, bacon, melted provolone over easy egg, parmesan cream sauce. Southern style mac and cheese bubbly hot topped with 2 over easy eggs and drizzled with a chipotle aioli. Scrambled eggs, bacon, cheddar jack w/ tomato jam on house made Belgian waffle. 2 ground chuck patties, melted cheddar, roasted tomatoes, over easy egg on brioche roll. Prosciutto, Parmesean bake into a fluffy egg strata (the frittata's cousin). Served w/ salad and biscuit. 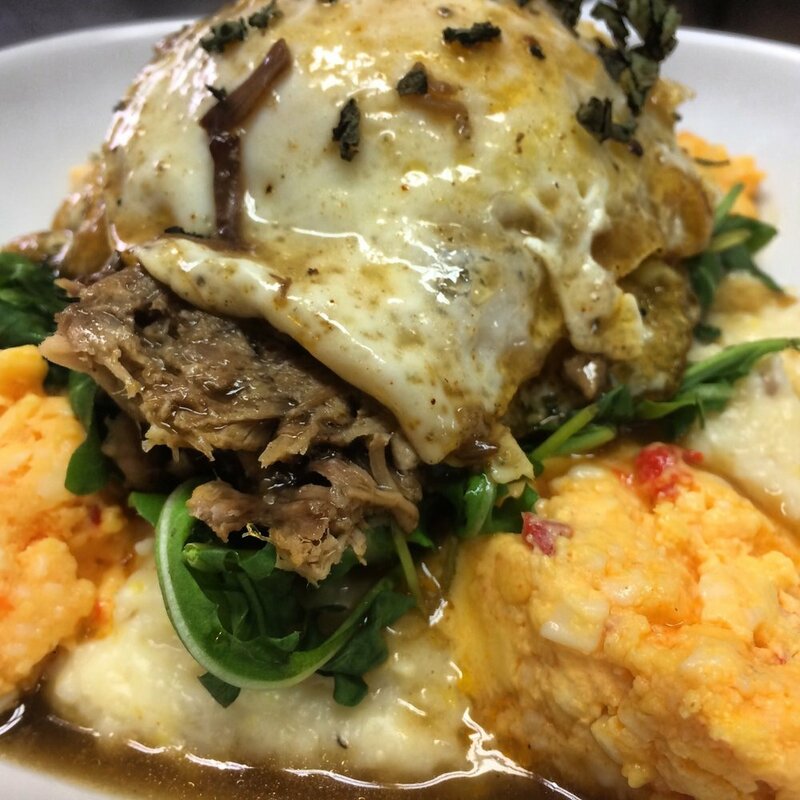 House roasted sweet potato hash, our cumin pulled pork, over easy eggs, topped with jalapeno hollandaise sauce. Served w/ biscuit. Warm biscuit pilled high with scrambled eggs, potatoes, savory ham and sausage gravy. Open faced biscuit, cheddar jalapeno grits, pimiento cheese, over easy eggs, arugula and drizzle country french gravy. Slices of imported Brie cheese, roasted apples, organic spinach, scrambled eggs on a bed of rosemary spuds. Cheddar jack and organic spinach. Served w/ biscuit. Bacon, sausage and ham, Swiss, cheddar jack in 3 egg omelet. Served w/ biscuit. Onion, bell pepper, spinach, in scrambled eggs topped with burrata. Served w/ biscuit. Chicken andoiulle sausage in fluffy scrambled eggs topped w/ house made pimiento cheese and avocado. thick cut tortilla chips and sausage scrambled into fluffy eggs, cheddar jack, on cumin black beans. House made pimiento cheese, avocado and smoky salsa. pressed on sourdough hot and melty. Cured salmon, lettuce, tomato, creme fraiche on baguette. Pulled chicken breast, zesty buffalo sauce, lettuce, tomato, pickles. Blue cheese dressing on side. Dressed with lettuce, tomato, pickle, provolone cheese and pesto aoili. with smoked aoili, Swiss, arugula, sliced tomato, grilled onions and peppers. On soft roll w/ lettuce, sliced tomato. Swiss and chipotle aioli. Mesquite pulled chicken, Bourbon Mustard BBQ, cole slaw and pickle on brioche buns. House roasted pork, ham, Swiss, pickles and Mojo sauce pressed on Cuban roll. Bacon, roasted turkey, house made pimiento, arugula. on warm baguette.. Ground sirlion meatloaf or grilled chicken breast, collard greens, mashed potatoes, corn bread. House made scoop of basil chicken salad, potato salad and mac salad on organic greens.White Balsamic vinaigrette. Served w/ biscuit. Our famous basil chicken salad, organic greens, micro greens, avocado. Balsamic reduction and chipotle aoili drizzle. Served w/ biscuit. *All sandwiches choice of homemade potato salad, mac salad or house made coleslaw. You can rent our lovely space for your your next event- party or even large family get together. Email us - sweetdixiekitchen@outlook.com. Comfort, Location, Fun!!! !